Dunkin’ Donuts will host a grand opening April 2 at its new Brockport location, 4675 Lake Road. To celebrate the grand opening, the restaurant will hold an event with food and beverage samplings, a raffle with prize giveaways and more. The location has been open since March 13. The new restaurant is open from 5 a.m. to 10 p.m. every day and will employ approximately 20 crewmembers. The restaurant features comfortable seating and also offers flat-screen televisions, free Wi-Fi, music and outdoor patio seating during the warmer months. The new restaurant in Brockport serves a complete menu featuring hot and iced coffees, along with espresso, cappuccinos and lattes and its recently introduced macchiato. 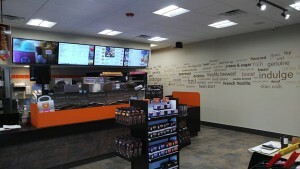 Dunkin’ Donuts also serves a full lineup of donuts, bakery goods and sandwiches, including its new GranDDe Burrito. All Dunkin’ Donuts menu items are available any time of day and guests are encouraged to customize their favorite food and beverages. Indus Hospitality Group, the Dunkin’ Donuts’ franchisee for the new restaurant in Brockport, currently operates 20 Dunkin’ Donuts restaurants in Western New York.